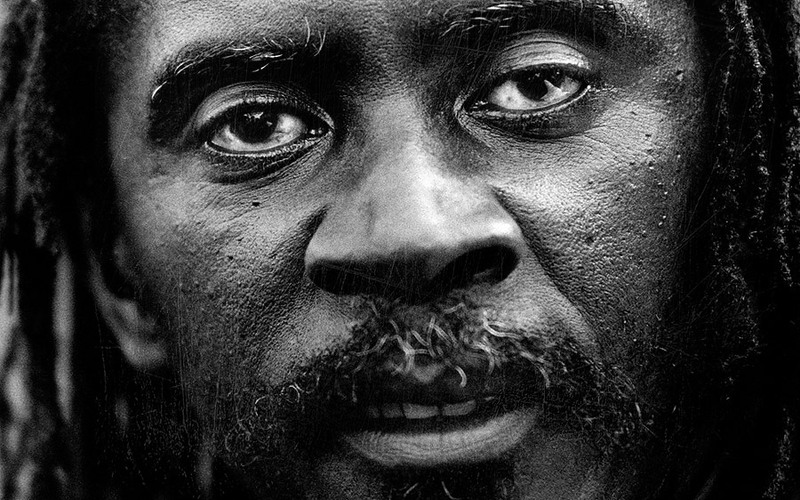 Photo Everton Blender black and white photo shot by Floyd Celluloyd for Innermann a decade of reggae photography. Please respect the copyright. Do not use the photos without written permission. Everton Dennis Williams was born in the parish of Clarendon, Jamaica, but grew up in Kingston 13 on Maxfield Avenue. He worked as a painter, construction worker and decorator, but he realized that the strong chemicals he was working with were not good for his voice or his health in general. With divine help and direction, he decided to leave his job to pursue a singing career. Although Everton had recorded a handful of singles for various producers, he had yet to score with a hit on the Island. But that was about to change. In 1991 he voiced the autobiographical “Create a Sound.” The song described Everton’s experiences in the music business and with the Rasta faith. It was released the following year on the Star Trail label, and it was Everton Blender’s first hit. He continued to record for Star Trail, who had a distribution deal with Heartbeat Records. 1994’s Lift Up Your Head (HB 169) was Everton’s full length debut, and featured “Create a Sound,” along with the hits, “Family Man,” “Bring di Kutchie,” “My Father’s Home,” “Gwaan Natty,” and the title track, which would go on to become one of the biggest anthems of the 1990’s.